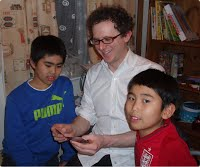 Would you like to teach Japanese children in London one or two evenings a week? Hello England is looking for friendly, professional teachers who can teach one-to-one English lessons for a few hours on one or two weekday evenings to Japanese children (usually between 4.30 – 7.30pm) , or weekdays daytime (between 10.00am-3.00pm) to Japanese adults. The lessons are taught at the student's home, typically in Acton or Ealing. This position would suit someone who enjoyed teaching in Japan, and would like to continue to have contact with Japanese families in England. Applicants must be able to speak simple conversational Japanese (Nihongo Noryoku level 3 or above), be reliable, presentable and enthusiastic about teaching. Long-term commitment is important (9 months +), as students do not like to switch teachers after only a short time. Applicants must have at least one year's experience of teaching in Japan. The standard rate is £20/hr.